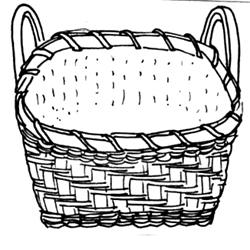 The Peach Basket Kit is a roomy twill pattern with 2 bushel side handles. Uses 1/2" flat, 1/4" flat, 1/4" flat oval, #4 round, #6 round & your color choice of dye for accent 1/4" flat. Peach dyed accent twill is shown. Remember to select your choice of dye color. We'll send peach dye if no choice is specified. 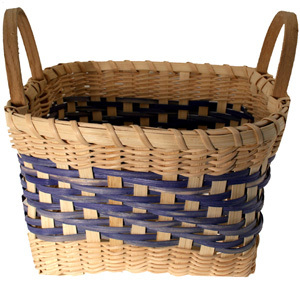 This is a fantastic basket—durable and useful for so many uses. SKILLS LEARNED: Square base with flat reed, plain-weave with round reed, twill weave with flat reed, Cut and Tuck, notched handle application, rim lashing are skills learned with the Peach Basket Kit.